TORONTO -- Ontario's governing Liberals plan to toughen penalties for motorists who are caught phoning or texting while driving, which could include demerit points. "There will be action coming, whether it's regulations, whether it's legislation or some combination of education and new penalties -- haven't decided," Transportation Minister Glen Murray said Wednesday. "We're really in the middle of looking at what would be most effective." Murray said he personally supports stiffer penalties for distracted drivers. There are concerns that the current fines aren't sufficient, given that there have been 235,000 charges laid in the last three years, he said. "We're getting a lot of complaints," he said, adding that 20 per cent of all collisions result from distracted driving. The government is also looking at penalties for "dooring" -- when cyclists collide with a vehicle door that's suddenly opened, said his spokesman Patrick Searle. Four years ago, the Liberals banned drivers from using any hand-held electronic devices to text, e-mail or talk while driving, except for 911 calls. 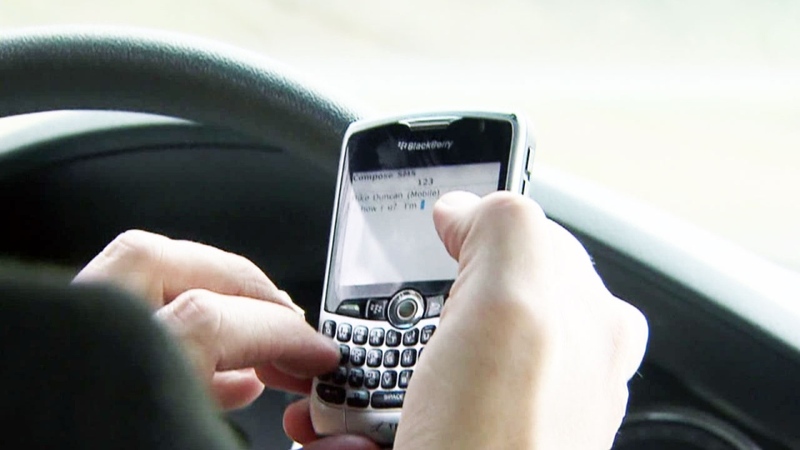 Ontario's top court says it's illegal to even hold a phone while driving. Drivers are also forbidden from using portable video games or DVD players. Global positioning systems are allowed, as long as they're properly secured to the dashboard. Fines start at $155 in Ontario, but unlike other provinces, there are no demerit points attached. All provinces and territories, save Nunavut, ban drivers from using cellphones while driving, according to the Canadian Automobile Association. Fines range from $100 to $400. Six provinces and two territories also include demerit points among the penalties. About 80 per cent of CAA members support demerit points for distracted driving, said Elliott Silverstein, CAA manager of government relations. "I think it's an important step because when you talk about the risks involved in distracted driving, the severity is there," he said. The Progressive Conservatives say they support punishing distracted drivers with demerit points, which would drive up their insurance costs and force them to take a driver's test. "Right now, it's not working what's going on," said Tory Jeff Yurek. "Too many people are being killed due to distracted driving and we need to do something as a government to ensure that decreases." Demerit points are applied if a driver is convicted of breaking certain traffic laws. They stay on a driver's record for two years from the date of the offence. Drivers can lose their licence for up to two years if they collect too many points. But New Democrat Leader Andrea Horwath said she's not sure whether the Liberals will ever move ahead with the changes. "I think there was a sense that the government was really interested in doing this, and now my understanding is that they're pulling back a bit for more consultation and discussion," she said. "I guess it's going in the Liberal Bermuda Triangle of consultation and discussion." The opposition parties have mocked Premier Kathleen Wynne over her propensity for consultation, saying she's created 36 panels to advise her government since she became premier last February because she can't make any decisions. They include consultations on issues such as funding public transit, the embattled horse-racing sector, minimum wage, jobs and growth, payday loans, the towing industry, a long-term energy strategy, the scope of practice for nurses, changing the mining tax, putting calorie counts on restaurant menus, university course loads and even bee health. Wynne says she isn't going to apologize for consulting the public on important issues, adding that the previous Tory government often acted without first talking to people.